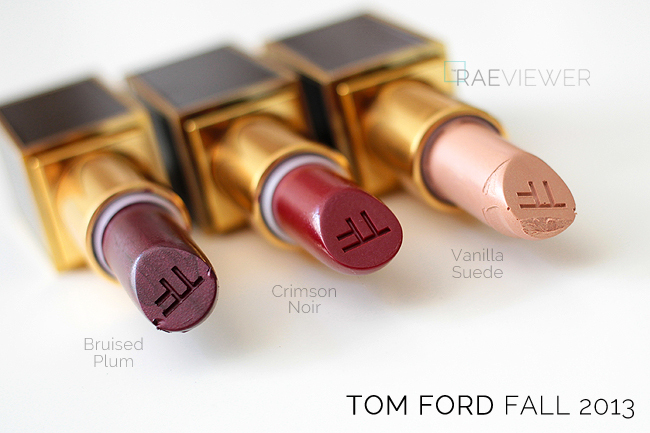 Tom Ford's Fall 2013 collection boasts four unique lipsticks, two of which I own and have already reviewed in the past. 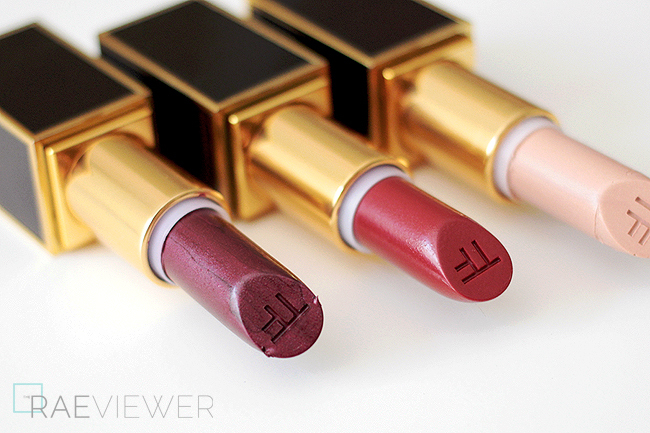 This review will discuss all the shades but showcase the Tom Ford Lip Colors in Crimson Noir and Bruised Plum, $49 USD each. These brand new colors may look intimidating at first since Crimson Noir sounds like dried blood and Bruised Plum reminds me of fruit I'd rather not eat. 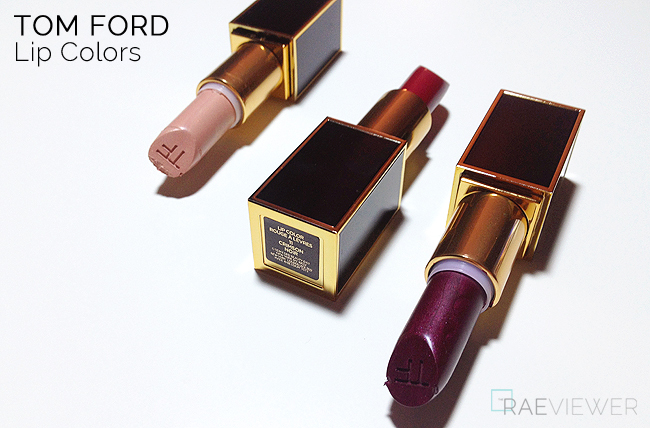 Rest easy, though, because these are some of the loveliest Lip Colors that Tom Ford has ever released. See all details and swatches after the jump! Sable Smoke (not pictured in this post) is a peachy brown-beige on me. 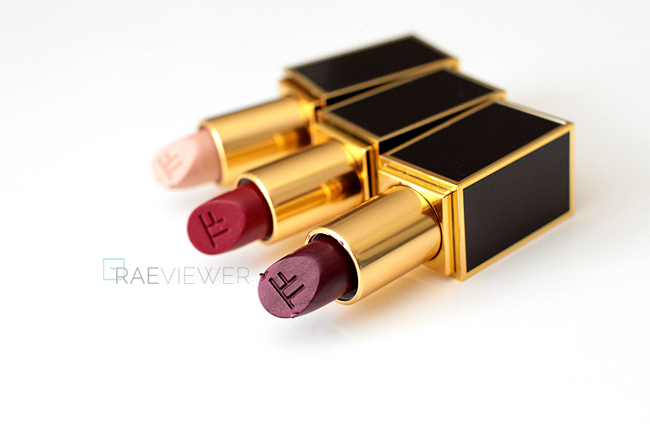 It was the very first Tom Ford lipstick in this updated cognac and gold packaging that I purchased, years ago already. I love Sable Smoke because it is an opaque, satin lip color that does not wash out my complexion. It is part of the permanent collection, so there is plenty of time to save and splurge. 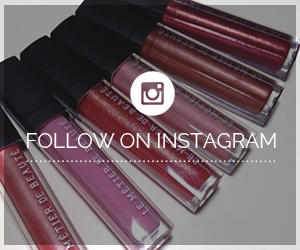 Until then, you can watch my first impression review of the color HERE and see which gloss I like to pair with it. Vanilla Suede is a formerly discontinued color that launched with Tom Ford's original Private Blend collection of lipsticks. I still own my original tube, packaged in white and gold lacquer! It was one of my favorite pale nudes, but it looks much better on me when I am tan (Chanel 40 in foundation color). You can click HERE see it alone on my lips in this very, very old video. I currently prefer to wear it topped with with a gloss. 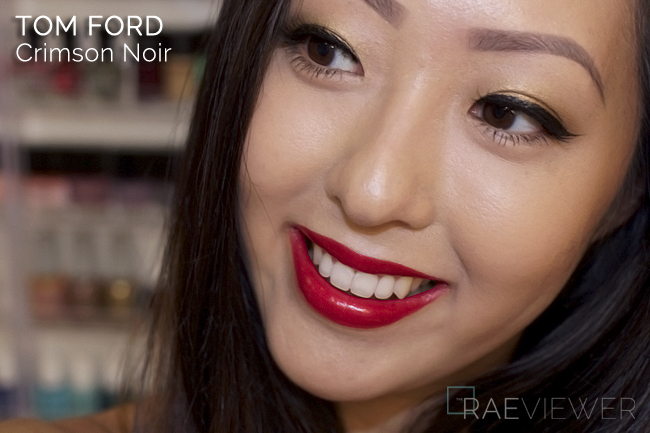 Crimson Noir (below) is officially one of my top 5 lipsticks and possibly my all-time favorite Tom Ford lipstick. There is a hint of pink to this timeless red, which brightens up my teeth and makes my complexion look more lively. I can wear just one swipe for a glance of color or add more for a deeper red lip that is glossy and hydrated. It is incredibly smooth and even, with shimmer so fine that I could only detect it under harsh artificial light. I usually like to top my lips with gloss, but Crimson Noir should be allowed to shine on its own. I swiped it across my lips directly from the tube, though you might try using a lip brush for the most precise edges if that is your preference. NOTE: On my eyes are Em Michelle Phan's Gold Lamé and Bronze Cuff with Lancôme's Artliner & Tarte's Lights Camera Lashes Mascara, topped with Velour Lashes in Oops Naughty Me. Brows are, as always, Cle de Peau's Eyebrow Pencil. Bruised Plum (above) is a completely shocking look for me, especially since reds are as dramatic as I usually go. 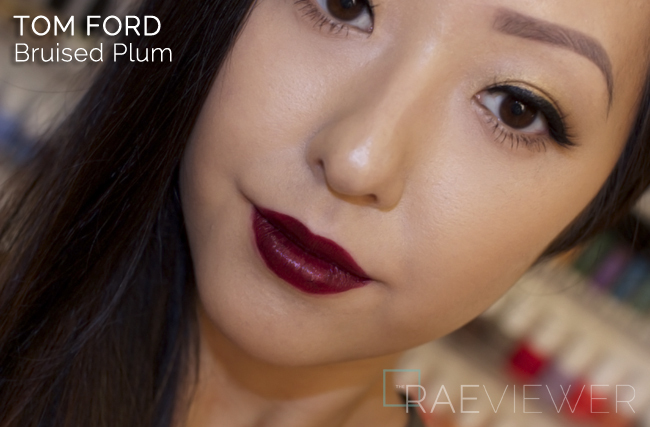 Darker lip colors have a tendency to age me, but Bruised Plum has the perfect balance of color and shimmer. It is absolutely stunning when worn as a stain because the lipstick then wears like a bright plum-tinged pink, which is too pretty for words. When layered for full color coverage like in the photo above, it is very close to the color in the tube. I should have worn it with with a lip pencil and used a lip brush, but I wanted to highlight the lipstick's look when applied straight from the tube. Bruised Plum is edgy but fun, with a slight edge over Crimson Noir in the versatility department, making it a great investment lipstick. In the swatches above, the left swatch of each shade is one swipe of color directly from the tube. 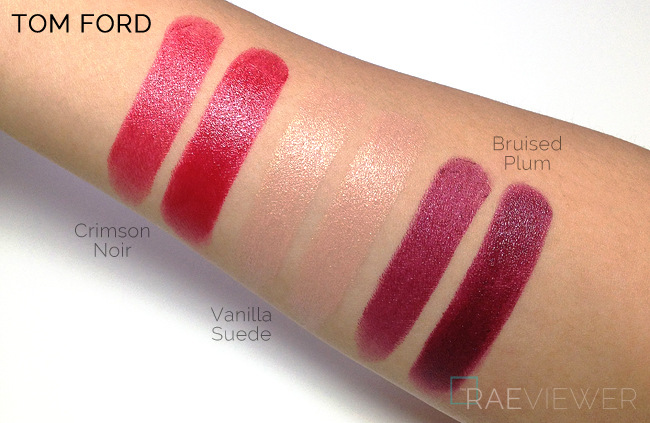 The swatches on the right are three swipes of each shades. 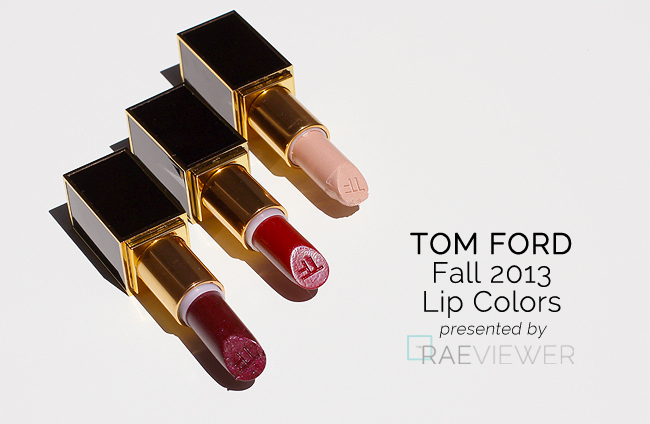 All the Lip Colors from this lovely Fall 2013 collection are now available at Tom Ford boutiques and online at Neiman Marcus, Bergdorf Goodman, Bloomingdale's, and Saks Fifth Avenue. Bottom Line: I never thought I could be this in love with "vampy" shades, but Crimson Noir and Bruised Plum make me giddy with happiness! Can you show me how's Vanilla Suede looks on your lip?Much thanks! The finish of Crimson Noir looks incredible on your lips! I'm really loving Bruised Plum too, it's a perfet plum for the upoming seasons. Very tempting! You always look stunning with red lips, the bruised plum looks fantastic on you (as expected!) and so on trend this season. Loving it so much! What foundation did you use for the photos ? It's just flawless !!! 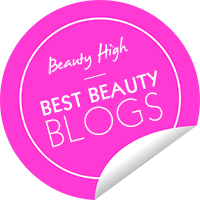 What lipgloss do you use with this lipsticks? I need bruised plum in my life.